The two scrapers are nice to use, especially for those of you who don't like to scratch their plates with a metal scraper. I usually use an old plastic card, but these are just as good for the job. Now let's get to the important part, namely the stamper. This double sided stamper has a small red end of about 15 mm in diameter that can be used for the smaller images that don't fit the whole nail. The other end, also known as the XL end, is fairly larger compared to a regular Konad stamper. The Konad has about 22 mm in diameters while this one has about 28 mm. It's great to use for larger images like the ones on Cheeky or FUN plates. If you have long nails or wide nail beds this is perfect. I personally have a huge thumb nail and the XL stamper is the only one that properly fits it. What I noticed with this stamper is that the white silicone part is firmer compared to my other XL stamper that is more squishy. I don't know if this is consistent with all the Born Pretty XL stampers or not. 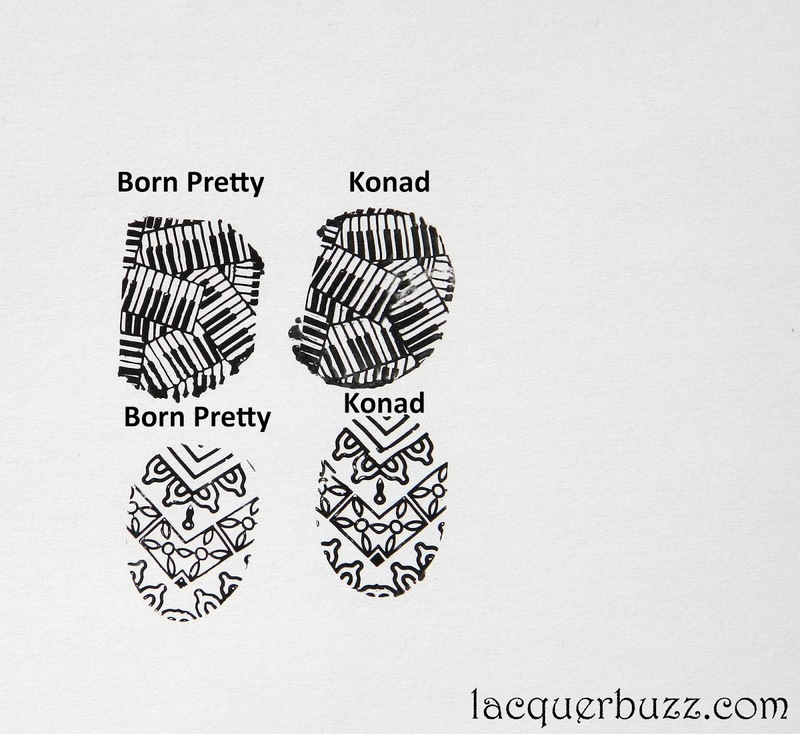 I first tried to stamp with it using Konad black and then stamped the same image with the Konad stamper next to it. 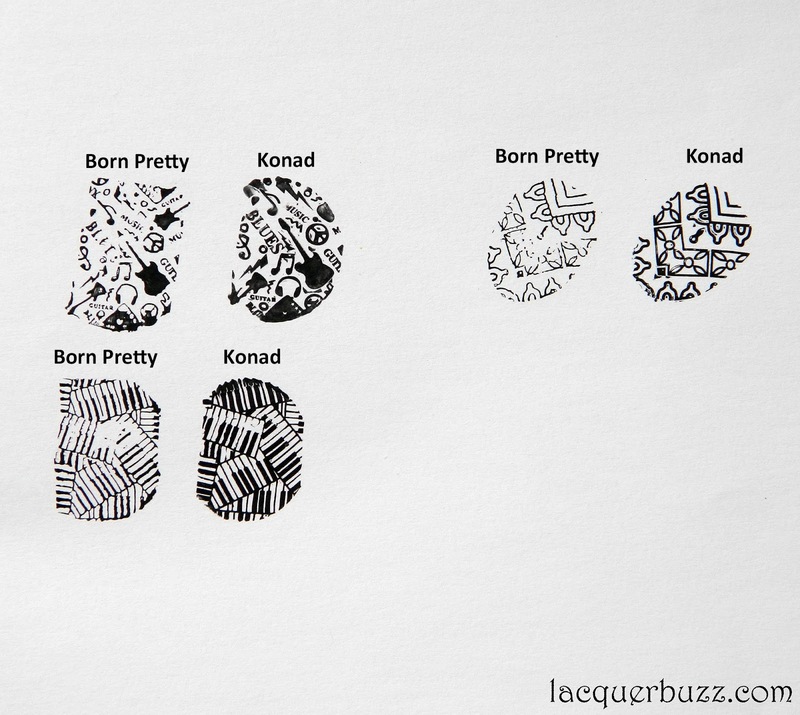 You can see in the picture above that the images didn't come out as crisp as they do with the Konad stamper. So I took an eraser and buffed the surface of the stamper to make the polish adhere to it better. After doing this it worked just as good as the Konad one. The buffing can also be done using a nail file. Here's the result after the buffing. Just another quick tip for this kind of stamper. The white silicone part is very sticky and it picks up lint and dirt like there's no tomorrow. So cleaning it with a wipe and acetone isn't quite an option. Instead of that you can use scotch tape to clean it. Just stick a piece of scotch tape on it and it will pick up both dirt and polish residue leaving the stamper perfectly clean. If you are interested in this stamper and scraper set you can find it here. Don't forget to use code MFL91 at checkout for an extra 10% off. Shipping is free! helping it stamp better as well. Foarte informativ tot ce ai scris, mai ales pentru mine care sunt novice in stampilat. Chiar daca am kit Konad de ani de zile, nu prea am utilizat-o foarte des, acum recent am cumparat placute noi si din aceasta cauza ma intereseaza tot ce este legat de obtinerea unei imagini perfecte pe unghii! Iti urez un weekend linistit! Thank you so much! I really did my best to incorporate every aspect into this review. And I know some of these tips are only shared on nail groups and communities so it's great to let more people know. Multumesc tare mult! Sa stii ca si pentru stamperul Konad e valabila chestia cu scotch-ul. Eu numai asta folosesc pentru curatat. E mult mai curat si mai usor, plus ca nu consumi o tona de acetona degeaba.